Troubled US carmakers GM and Chrysler have asked the US government for another $21.6bn (£15.2bn) in support, on top of the $17.4bn already received. The auto giants also plan to axe 47,000 and 3,000 jobs respectively, as well as shedding a number of car models. The moves form part of their drastic restructuring plans submitted to the US Treasury Department on Tuesday night. It came as the United Auto Workers (UAW) union reached agreement with GM, Chrysler and Ford on contract changes. 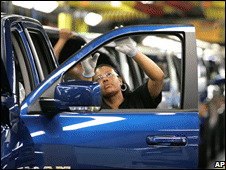 The UAW is one of a number of stakeholders whose agreement is needed before the proposed plans can be pushed through. General Motors said it would try to borrow up to $16.6bn more from the government, on top of the $13.4bn it has already received. Its plan includes cutting 47,000 jobs and closing five more US factories, with about 26,000 of the cuts taking place outside the US. The job cuts would take place by the end of 2009 and are the largest work force reduction announced by a US firm in the current downturn. GM has also put its Saab business up for sale, and "given the urgency of stemming sizeable cash demands associated with Saab operations" is requesting Swedish government financial support prior to any sale. However, on Wednesday the country's Enterprise and Energy Minister Maud Olofsson told Swedish public radio that "voters picked me because they wanted nursery schools, police and nurses, and not to buy loss-making car factories". In December, GM had said it would cut the number of plants from 47 in 2008 to 38 by 2012, but has now said a further five factories will be shut, which would leave it with 33 facilities. The carmaker's brands would also be reduced from eight to four - Chevrolet, Buick, Cadillac and GMC. GM chief executive Rick Wagoner said the company's plan was "comprehensive, responsive, achievable and flexible". "We have a lot of work in front of us, but I am confident it will result in a profitable General Motors," he added. The plan came after Chrysler, which was given a $4bn loan by the US government at the end of 2008, revealed its own survival plan. 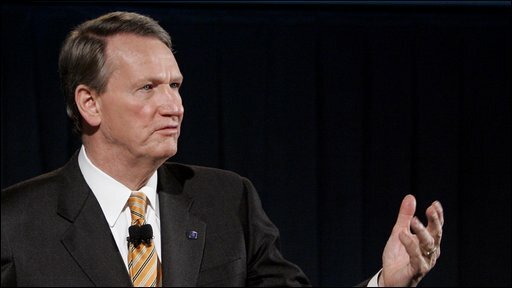 Chrysler has asked for another $5bn funding, and plans to cut 3,000 posts. The firm will also cut three car models in 2009 - the Chrysler Aspen and PT Cruiser, and the Dodge Durango. Unveiling its proposals, Chrysler said it now expected the current downturn in the US car market to last another three years. The US's third-biggest carmaker said its radical surgery had the support of the United Auto Workers (UAW) union, dealers, and suppliers. The UAW said it had also reached tentative agreement with Ford and General Motors to help cut those firms' labour costs. Chrysler also said it planned to cut outstanding debt by $5bn and reduce fixed costs by $700m in 2009. Analyst Lincoln Merrihew, of TNS Automotive Consulting, said: "I'm curious to see how the government responds to this plan, but Chrysler has said all the right things." GM confirmed last week it would be cutting 10,000 jobs worldwide by the end of 2009. About 3,400 jobs will go in the US under GM's initial restructuring plan submitted to the government last December. The US Treasury will be studying the survival plans for several weeks before making a decision whether to call in or extend the loans. The decision is due by the end of March. GM and Chrysler received their first bail-outs at the end of last year, warning that without the support they risked financial ruin. Ford, the third of the "Big Three" US carmakers, has yet to require any bail-outs, but says it may need funds in the future. GM, Ford and Chrysler have all seen sales fall sharply in their home market. While this decline reflects an industry-wide fall that has also hit European and Japanese carmakers in the US, the Big Three have also been criticised for not offering an attractive range of vehicles. It is argued they have been too slow in responding to the growing popularity of smaller, more fuel-efficient vehicles. Meanwhile, it has been reported that US President Barack Obama has decided to create a new car task force, designed to restructure the struggling industry. However, no formal announcement has been made so far. According to Obama administration officials, the force is an alternative idea to the option of a single "car czar" with far reaching powers. US Treasury Secretary Timothy Geithner and top presidential economic aide Lawrence Summers are said to head the multi-agency operation. White House spokesman Robert Gibbs said the task force would provide "a vast amount of expertise that crosses a number of governmental agencies and departments". The Detroit carmakers are considered to be too big to fail, as their collapse would trigger serious problems for suppliers, dealers and other businesses, potentially resulting in massive job cuts.